Early concept art of the Mars Science Laboratory -- a long-range, long-duration and heavy-duty rover for carrying out new science tasks on the red planet. It is slated for launch in 2009. While those unflappable interplanetary twins - Spirit and Opportunity - continue to trudge across Mars, engineers and scientists are readying the next robotic rover destined to trail across the distant sands of the red planet. The Mars Science Laboratory (MSL) is bigger, heavier, and more powerful than the machinery now at work on Mars. As the next robot to go mobile on Mars, building, testing, and then flying MSL has its challenges. That being said, and while now a solo mission, there is already talk that MSL may follow in the wheel tracks of Spirit and Opportunity - that is, doubling up on Mars. MSL would pick up, pocket and crush rock and soil samples, then dole out those specimens to on-board test chambers for chemical analysis. Carrying a set of scientific instruments, MSL's chores include identifying organic compounds such as proteins, amino acids, and other acids and bases that attach themselves to carbon backbones - the essentials for life, at least as we know it. It would also identify features such as atmospheric gases that may be associated with biological activity. Set for liftoff in 2009 and touching down on Mars in 2010, MSL builds upon the legacy of data gleaned by orbiters, landers, and rovers. But that doesn't make getting hardware safely down on Mars any easier. "I think we're in excellent shape," said Peter Theisinger, Manager of the MSL project at NASA's Jet Propulsion Laboratory (JPL) in Pasadena, California. "As you would expect, at this point in time, there's more work to do, more design uncertainties to retire...but we're in good shape," Theisinger said. "It's coming together very well right now," he told SPACE.com. Theisinger is drawing upon a unique reservoir of coolness, bolstered by his former Mars job. He was project manager for the Spirit and Opportunity Mars Exploration Rover (MER) Project. About three times heavier than a MER robot, MSL is on the order of 20 percent bigger in terms of wheel base in both directions, and a little bit taller, Theisinger explained. With an anticipated mobility range of some 12 miles (20 kilometers), "we expect it to last two Earth years...one Mars year," he added. MSL would be the first mission to steer itself toward the martian surface, autopiloting its way precisely to a desired landing zone. It would make its way toward a somewhat circular landing ellipse roughly between 6 miles to 12 miles across (10 kilometers to 20 kilometers). That's a much smaller piece of real estate to reach than targeted by Spirit and Opportunity. More of Mars will be within reach of MSL than previous landers, including access to higher terrain and a "fantastic majority of the southern highlands," Theisinger noted. A decision on where the rover will set down is still to come. Imagery from the soon-to-be-launched NASA Mars Reconnaissance Orbiter will contribute to pinpointing prospective landing sites. "The challenge will be to winnow down the alternatives," Theisinger said. One of the tougher MSL assignments is getting the six-wheeled rover onto Mars. As currently envisioned, a rocket powered "Skycrane" - offering the ultimate in planetary "hang-time" -- would hover above the landing site and gently lower the large laboratory to the surface via a lengthy tether. After performing its aerial acrobatics, the Skycrane would fly away and plop down at a spot distant from the MSL landing locale. Theisinger said the Skycrane idea has undergone review by experts inside and outside of JPL's gates. Questions regarding the hardware's controllability - and how best to shakeout this technology -- have been attacked with vigor, he suggested, but other landing schemes are also being studied if the Skycrane craters as a workable plan. To further assure that the Skycrane landing method is the right approach, money is being spent on facilities to perform touchdown testing. "We are very much committed to test as you fly," Theisinger noted, "and fly as you test." As was the case for Spirit and Opportunity, the entry, decent and landing of those vehicles could not be fully practiced end-to-end on Earth. "What we can't test we have to tie things together with simulations and analyses," Theisinger said. MSL is intended to be a long duration, wide-access mission to the red planet. Given that, nuclear power is the energy of need, Theisinger said. Surviving on Mars over the long haul and the prospect of widening the range of MSL's tour-of-duty demands nuclear power, he said. The price tag for the MSL project is just under $1.5 billion - that includes the rover's nuclear power source, as well as the launcher to hurl the hardware to Mars - either a Delta 4 Heavy or an Atlas 5 rocket. 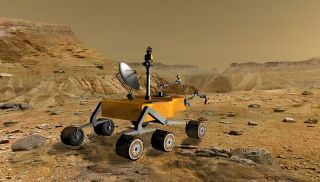 At present, MSL is a one-of-a-kind robot mission. That could change. Talk has begun on tossing two of the roving labs Marsward. "We have provided the program with estimates of what it would take to fly two. It's up to my management to decide whether the risk/reward ratio is favorable for doing that," Theisinger said. "There is no technical or schedule reason why it's not feasible." A decision on doubling up on Mars with MSL would have to made within the first half of this year, Theisinger pointed out. "It's a conversation we have to have with those developing MSL's payload too...what they would need in order to build two." Last month, NASA selected key science gear and associated investigations for the mobile Mars rover. Mars Science Laboratory Mast Camera: Performs multi-spectral, stereo imaging at lengths ranging from kilometers to centimeters, and can acquire compressed high-definition video at 10 frames per second without the use of the rover computer. PI, Michael Malin, Malin Space Science Systems, San Diego, California. ChemCam: A laser-induced remote sensing device for chemistry and micro-imaging. It ablates surface coatings from materials at standoff distances of up to 33-feet (10-meters) and measures elemental composition of underlying rocks and soils. PI, Roger Wiens, Los Alamos National Laboratory, Los Alamos, New Mexico. Mahli: This Mars HandLens Imager for the Mars Science Laboratory images rocks, soil, frost and ice at resolutions 2.4 times better, and with a wider field of view, than the Microscopic Imager now onboard the dual Mars Exploration Rovers, Spirit and Opportunity. PI, Kenneth Edgett, Malin Space Science Systems, San Diego, California. Alpha-Particle-X-ray-Spectrometer: Reveals elemental abundance of rocks and soil. It will be provided by the Canadian Space Agency. PI, Ralf Gellert, Max-Planck-Institute for Chemistry, Mainz, Germany. CheMin: An X-ray Diffraction/X-ray Fluorescence instrument for definitive mineralogical analysis. It identifies and quantifies all minerals in complex natural samples such as basalts, evaporites and soils, one of the principle objectives of the MSL mission. PI, David Blake, NASA's Ames Research Center, Moffett Field, California. Radiation Assessment Detector: Characterizes the broad spectrum of radiation at the surface of Mars, an essential precursor to human exploration of the planet. The instrument would be funded by the Exploration Systems Mission Directorate at NASA Headquarters. PI, Donald Hassler, Southwest Research Institute, Boulder, Colorado. Mars Descent Imager: Produces high-resolution color-video imagery of the descent and landing phase, providing geological context information, as well as allowing for precise landing-site determination of the rover. PI, Michael Malin, Malin Space Science Systems, San Diego, California. SAM: This Sample Analysis at Mars features an integrated set of devices consisting of a gas chromatograph mass spectrometer and a tunable laser spectrometer. It conducts mineral and atmospheric analyses, detect a wide range of organic compounds and perform stable isotope analyses of organics and noble gases. PI, Paul Mahaffy, NASA's Goddard Space Flight Center, Greenbelt, Maryland. MSL is also toting to Mars a pulsed neutron source and detector for measuring hydrogen -- including water -- provided by the Russian Federal Space Agency. In addition, the rover is to be equipped with a meteorological package and an ultraviolet sensor provided by the Spanish Ministry of Education and Science. "The MSL team is working diligently to accommodate the breakthrough payload that was recently selected, clearly the most scientifically powerful in history, and our first real 'shot' at following the biogeochemical cycles on another world," said James Garvin, NASA Chief Scientist at the space agency's headquarters in Washington, D.C.
Garvin told SPACE.com that MSL will carry devices to measure on-the-spot ionizing radiation. Also, the heavy-duty rover will perform general meteorology, water content assessments, mineralogy, and image at scales beyond those that the Mars Exploration Rovers have so effectively demonstrated, he said. The MSL payload is very "exploration-centric", Garvin concluded.